From May to August of this year, Samsung and Apple(s aapl) continue to grow handset sales in the U.S. while Motorola(s mmi), Research in Motion (s rimm) and LG are losing ground. The data comes from a ComScore report published on Wednesday and indicates that the two dominant handset makers have more compelling products for sale. 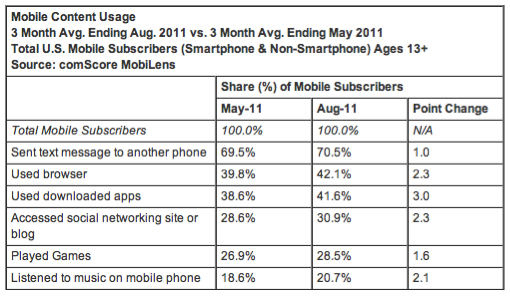 And this sales data is prior to the new Apple iPhone 4S and Samsung Galaxy S 2 smartphones. Samsung accounted for 25.3 percent of all handsets sold by the end of the quarter, up from 24.8 percent three months prior. Likewise, Apple’s share jumped to 9.8 percent from 8.7 percent; likely boosted by availability on Verizon’s (s vz) network and because the company’s iPhone 4 is still the top selling smartphone, even after launching more than 16 months ago. The overall percentages may sound low, especially for Apple, but that’s because ComScore is measuring all handset sales, not just smartphones and all of Apple’s phones are considered to be smartphones. So too are RIM’s, but the BlackBerry-maker saw its share decline to 7.1 percent; down a full percentage point from May. Motorola and LG both sell feature-phones as well as smartphones, but that didn’t help either as both saw a share decline. All three laggards lack a flagship device that can compete well against the best that Samsung and Apple deliver. Motorola’s original Droid line started strong in 2009 and continued through 2010, but the Motoblur user interface changes never proved popular. LG was late to the smartphone game and although it offers some solid devices, such as the T-Mobile G2x, it has no standout features that differentiate it from Samsung’s Galaxy S II. And RIM continues to take too long to transition from BlackBerry OS 7 to QNX, which doesn’t help attract new customers. The situation is only going to worsen over time unless these three can change buyer’s perceptions and move more quickly in the fast-paced handset market. 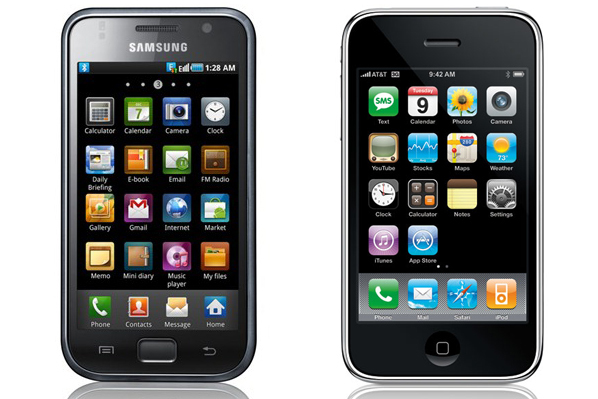 Relying on feature-phone sales isn’t a smart strategy since Americans are transitioning rapidly to smartphones. Put another way, if your smartphone isn’t soon competitive, be prepared to let the two leaders keep gaining share at your expense. Making matters worse (or better if you’re Apple or Samsung) is the growing reliance consumers are placing on their handsets. ComScore found that all of the activities it tracks — apps, messaging, browsing, music consumption, gaming and social networking — are up, meaning that the phone is becoming more important to our daily lives. Consumers will likely be far less forgiving of buggy phones or non-intuitive user interfaces on highly used devices, as a result. And Microsoft is continuing to lose ground. Any predictions there?